10/11/2013Share this story on Facebook! What started in 2005 as an idea for an Internet video sharing site has grown to be one of the most popular global web services. Today 72 hours of video is uploaded every minute to YouTube, and the site has around 800 million users. 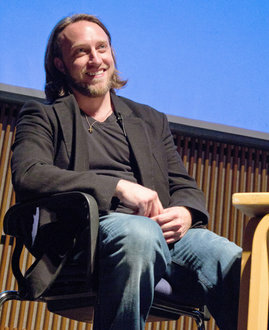 Cofounder and former CEO of YouTube Chad Hurley engaged in a Q&A in front of a student audience at Ithaca on September 25. An entrepreneur with a background in graphic design, Hurley attracted students from across campus interested in hearing his success story. Hurley says YouTube has truly changed the world we live in. It has offered a new way to gain celebrity status, and provided a platform for the President of the United States to reach a young audience. “The effect we saw YouTube have on the world was overwhelming…how it has affected society and politics was more than we could have planned for,” he says. Hurley said YouTube still stands out among other video hosting sites because its brand is that everyone can represent themselves how they would like to be represented. Hurley is now the CEO and cofounder of AVOS, a company helping developers create mobile and web applications. He attributes his success to characteristics he has always had: creativity and curiosity. Hurley says that his companies’ willingness and ability to change with the times and continually improve is what helps them to succeed. “No matter how much experience you have, you have to continue to think you know nothing,” he says. Hurley's talk was part of the Park Distinguished Visitor Series.